These short sleeve slip-on t-shirts with lap shoulders are perfect for easy dressing. 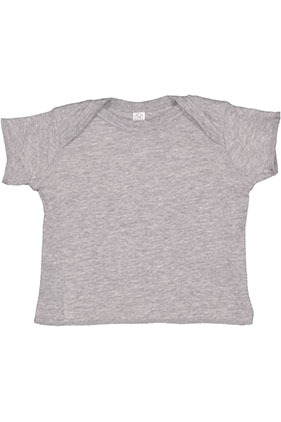 100% combed ring-spun cotton 5 ounce super soft 1x1 baby rib infant lap shoulder t-shirt. Flatlock seams for increased strength and durability along with a smooth edge perfect for baby's sensitive skin. Lap shoulder envelope neckline for easy on and off. Double needle ribbed binding on neck and shoulders for long lasting durability. Raw serge hem sleeves and bottom allow for easy, freedom of movement. Side seam construction for exceptional quality and durability. EasyTear™ label for additional comfort. CPSIA compliant tracking label in side seam. White is sewn with 100% cotton thread. (Heather 88/12).